I’m pretty sure everyone knows about this outfit. After patch 2.4.3 (yeah, that long ago ^_^ ), this whole set was given to players. 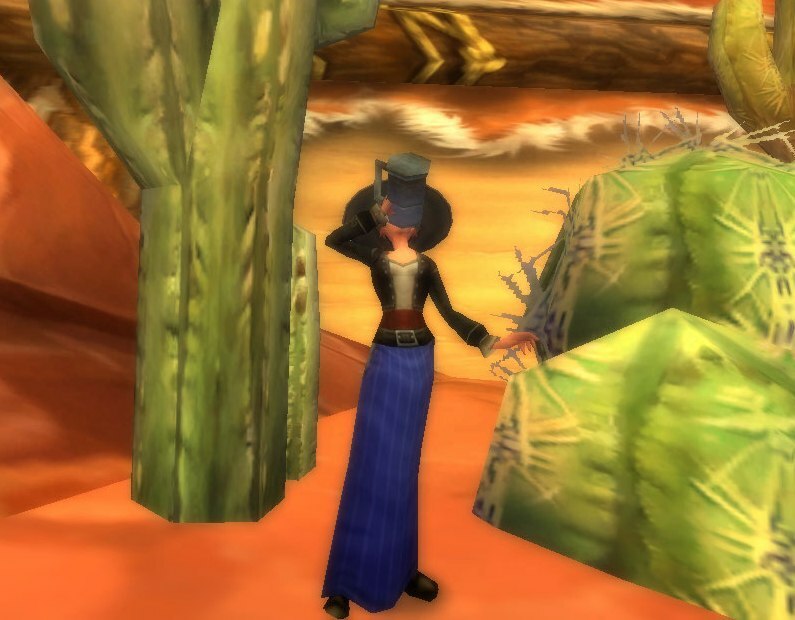 The Haliscan Pantaloons and the Haliscan Jacket are made by tailors, and the patterns can be bought by Haughty Modiste out by Steamwheedle Port in Tanaris. She also sells the pattern for Dress Shoes in a limited supply. And, although I am sure that any other black pair of boots would work just fine with this outfit, the Dress Shoes are really useful for other outfits, and aren’t BOE ^_^ . 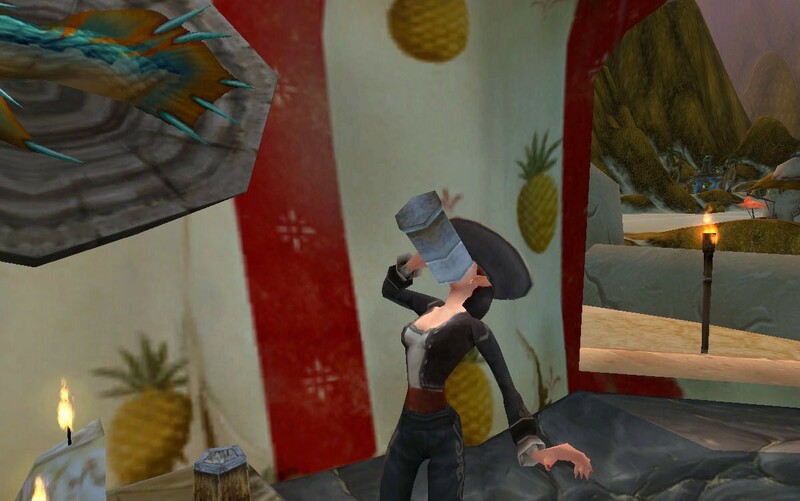 The jacket, pantaloons, and shoes have no level requirement, however, the hat was a reward from the quest, “Nice Hat“, also added during the same patch, and requires players to be level 66 to accept it. There is another hat just like it that, Don Carlos’ Famous Hat, and, upon equip, can summon a “coyote spirit” to hang around for a while. 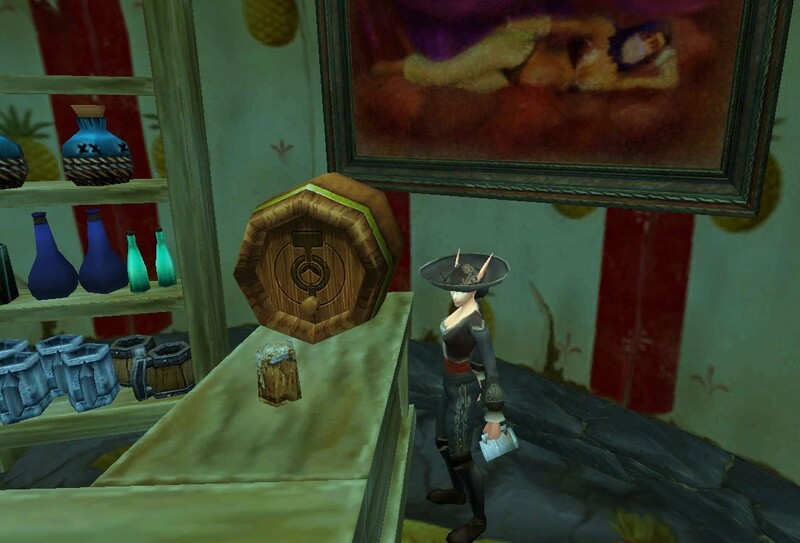 This hat, even though it does not say so, does require a player to be level 66, as it is a drop from the Caverns of Time…which you have to have been 66 to accept the pre-quest to even get in. /Sigh. Sorry for everyone who is not level 66 ^_^. The outfit is nothing without the hat, and I understand the frustration of having a semi-completed outfit and having to substitute pieces for a whole look. Even so, I find the pants very versatile for other outfits. I used Kirina’s Ornate Drinking Stein as my choice of off-hand, but, another one I find pertinent is the single Red Rose…muy romántico! I credit this outfit to Kamalia (it can be seen in her Filigreed Outfits article). I love how the fancy scroll design on the pants peaks out from the lace siding of the dress’s skirt. The same outfit, only with Kirina’s Forever-Lovely Rose equipped. This unique helm (added with the changes to the Love is in the Air event) also adds a romantic quality to these outfits. When equipped on female characters, the rose appears behind her ear; on male characters, the lover boy holds the long stem rose in between his teeth. 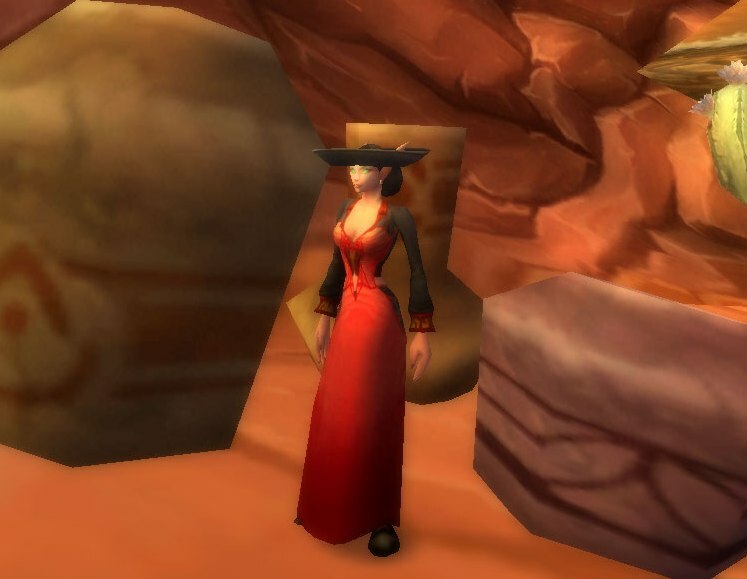 I wish one could still wear the sombrero with the rose helm, too…especially on guys ^_^. The Lovely Red Dress makes a great “dress” outfit, too.